Blog Roof Flashings and Leaks: Are They Synonyms? Roof Flashings and Leaks: Are They Synonyms? This article is a continuation from the previous one about the Importance of Roof Inspections. What’s Important to Your Roof besides Shingles? During a regular roof inspection, we must carefully review all types of roof flashings. Roof Flashings are a critical component of roofing systems and will usually be where you look for leaks first. Roof Flashings can include several types, including jack flashings, vent flashings, etc. as in the previous article. However, there is another very important type of flashing found on almost every roof in existence . This would include roof flashings where a roof intersect with other materials, such as a brick masonry chimney, vertical walls or even other slopes of the roof structure itself. This is an example of typical chimney roof flashings. It’s pretty standard stuff, although the shingles/valley metal tie-in is a little unusual; the video has a glare on the lens, so hopefully you can see as you watch it. This actually leads into a metal valley flashing. Most of the time you won’t get a lot of leaks on metal valley flashing unless you actually have a puncture of some kind. This particular case does have a little bit of rust discoloration going on, but overall it’s in pretty good shape. On this house as others, a chimney’s mortar joints against the actual metal roof flashings can create a condition we need to look at. Many times it will experience separation created by drastic temperature swings and the differences in material expansion and contraction rates. Between the seasons of ice storms and cold weather in the winter and the Texas summer heat our houses all feel and react to these differentials. 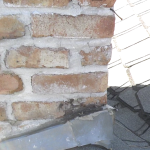 Texas summers alone can cause the mortar to crack and begin to deteriorate, creating openings perfect for water to find it’s way into your home. This chimney flashing has been previously but currently there is another leak which we believe is in this same area and needs to be investigated. This is common to many houses that are aging, and something you definitely want to catch early before serious interior damage occurs. Our Team at DFW Improved is experienced and professional. We can perform your Roof Inspections and will ONLY tell you there’s a problem when there is one. However, we believe that a Roof Inspection consistently performed on a roof and it’s related roof flashings can greatly reduce water damages resulting from normal wear & tear. This inspection will also provide a guide on the overall condition and likely life expectancy of your existing roof. That can greatly assist a homeowner in planning and budgeting for a roof replacement before the job is absolutely necessary and no funds are available…unless a major storm comes through. Whether you need help with water damage caused by leaky roof flashings or it's time for a total roof replacement, our team of insurance restoration experts can help you get your home back to normal. DFW Improved is proud to be a member of the business community in Plano TX, providing high quality construction expertise to homeowners in the Dallas / Fort Worth Metroplex. We are an award-winning contractor highly recommended on Angie’s List. We provide home remodeling, home improvement services and repairs that include bathroom remodeling, kitchen remodeling, outdoor living, and room additions throughout the North Dallas area. To see photos of our remodeling projects in Dallas and the surrounding areas, visit our photo gallery, visit us on Pinterest or connect with us on Facebook. DFW Improved is located at 6652 Pinecrest Drive, Suite 100 in Plano, TX, and provides an in-house Decorator and Showroom to help our customers with design selections.